The introduction of computing and communications technologies within cars raises a range of novel human-computer interaction (HCI) issues. In particular, it is critical to understand how user-interfaces within cars can best be designed to account for the severe physical, perceptual and cognitive constraints placed on users by the driving context. This chapter introduces the driving situation and explains the range of computing systems being introduced within cars and their associated user-interfaces. 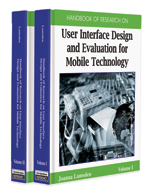 The overall human-focused factors that designers must consider for this technology are raised. Furthermore, the range of methods (e.g., use of simulators, instrumented vehicles) available to designers of in-car user-interfaces are compared and contrasted. Specific guidance for one key system, vehicle navigation, is provided in a case study discussion. To conclude, overall trends in the development of in-car userinterfaces are discussed and the research challenges are raised. Driving Simulators: Provide a safe, controlled and cost-effective virtual environment in which research and training issues related to driving can be considered. Simulators vary considerably in their fidelity (i.e., the extent to which they replicate aspects of real driving). Underload: (Due to in-car computing systems) occurs when automation of core driving tasks (such as steering, braking, etc.) has led to a situation in which driving performance has deteriorated. This may have arisen because the driver has reduced awareness of other road users, has changed their behavior in negative ways or has inferior skills/knowledge in driving. Overload: (Due to in-car computing systems) occurs when a driver’s information processing resources are overwhelmed and performance on primary driving tasks inevitably suffers. Keystroke Level Model: Is an established HCI method used to predict expert’s task times with a user-interface. It can be used with in-car user-interfaces to predict static task time, that is, the time taken to achieve tasks in a stationary vehicle. Recently, the KLM has been extended to predict visual demand measures related to the occlusion protocol. The Occlusion Protocol: Is a user trial method used in the design and evaluation of in-car user-interfaces. Participants typically wear LCD glasses which restrict the visual experience by only enabling short (e.g., 1.5 seconds) chunks of visual attention with an in-car user interface. Measures related to the visual demand of an interface can be established. Driver Distraction: Occurs when there is a delay by the driver in the recognition of information necessary to safely maintain the lateral and longitudinal control of the vehicle. Distraction may arise due to some event, activity, object or person, within or outside the vehicle that compels or tends to induce the driver’s shifting attention away from fundamental driving tasks. Distraction may compromise the driver’s auditory, biomechanical, cognitive or visual faculties, or combinations thereof (Pettitt & Burnett, 2005). In-Car Computing Systems: Provide information to support the driving task or control some aspect/s of the driving task. In-car computing systems may also provide information and/or services that are unrelated to driving.